The People: After 13 years in the Vail Valley, artist-architect Ty Gillespie and his wife, Helen, a well-known artist, decided they needed a change. After sailing around the globe on a 38-foot cutter, they settled in Paonia, where the beautiful setting and flourishing wineries inspired Ty to try his hand at making vino. With help from new friends, Ty scaled up his wine-kit experience to create the foundation of their new enterprise, which they named Azura for the boat on which they lived for five years. The Space: Only one corner of the Tuscan-style tasting room has a long counter and traditional wine-tasting paraphernalia; the rest of the spacious, sunlit building is filled with intricate sculptures and ornately carved, decorative boat hulls created by Helen and Ty. Just as impressive is the large stone patio behind the tasting room, which has an absolutely gorgeous view looking down into the lush North Fork Valley and its fringing peaks. The Grapes: Ty, the winemaker, uses only Colorado-grown grapes sourced predominantly from vineyards around Palisade. He also partners with a Napa winery to create Azura’s best-known product, a decadent Merlot Wine Sauce, perfect for pouring over ice cream or fresh fruit. The Wine: To leave enough time for his art, Ty focuses his attention on creating a limited selection of high-quality wines, including two white varietals, a crisp, refreshing Pinot Gris and a sweet Riesling ideal for serving chilled as an after-dinner drink. 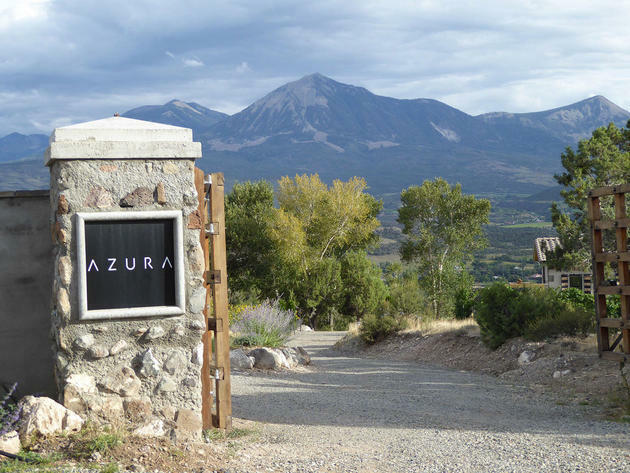 Buzzed Trivia: To the best of Ty’s knowledge, Azura is the only vineyard in the country that also has its own yacht club. It consists of a small pond on the lower slopes of the Gillespies’ property where a group gathers each summer on Sunday evenings to race small boats. They even have a few extra vessels for visitors to join in the fun. Taste it: Azura offers complimentary tastings from 11 a.m. to 6 p.m. daily from Memorial Day through the end of October. To celebrate their yacht club and boating background, the Gillespies named their peppery blend of Cabernet Franc, Merlot, and Syrah the Yacht Club Red, a ruby-red wine that pairs well with barbecue and grilled steaks. Ty also makes a full-bodied Cabernet Sauvignon, to which he adds a lively splash of spicy Syrah. Take Home: Instead of merely stopping by the vineyard, you can linger on Azura’s property by staying a night (or a week) in the cozy, terracotta-tiled guesthouse that Ty designed. You can also browse the Gillespies’ striking artwork if you’d like to take home a souvenir more permanent than one of their delicious bottles of wine.